CTL’s Project Based Learning professional development program provides the background, tools and support that elementary, middle, high school and postsecondary teachers need to help all students become creative, collaborative, critical thinkers. Academic Literacy to support content learning. We equip teachers to move from simply covering content to helping students uncover content themselves as they seek answers to Compelling Questions. Inquiry-based learning engages students by connecting their work to the world outside the classroom, while meeting rigorous standards within. CTL’s project based learning starts by helping teachers identify content standards and link them to projects that will foster deep, authentic learning for all students. In addition, CTL’s program incorporates the Academic Literacy strategies of our tested Adolescent Literacy Model (ALM), enabling mastery of content across subject areas as students learn to read, write, speak and listen like experts in their disciplines. CTL’s emphasis on Artful Thinking and Digital Thinking likewise provides opportunities for students to hone 21st Century/Next Generation Skills like creativity, critical thinking, communication and collaboration. The focus throughout is on quality of instruction and the learning culture of the school and classroom. CTL’s PBL fosters a professional learning community among teachers and administrators as they transition to a school wide culture of inquiry-based, authentic learning. As with all CTL professional development programs, mentor coaches work closely with teachers initially, and then continue to provide support on site and via distance. 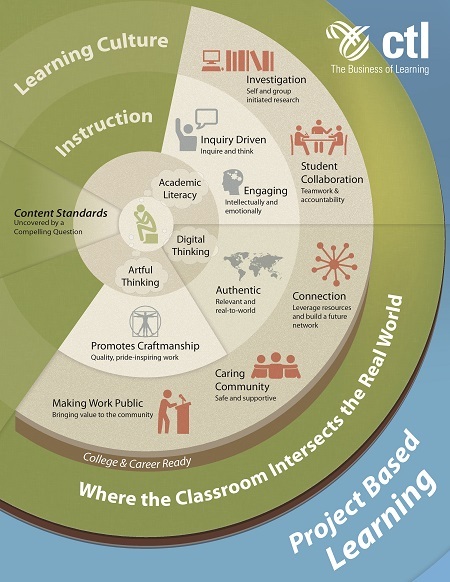 Through this approach, schools develop the capacity to independently sustain effective PBL for all students. Read about CTL’s collaboration with Mary Todd Elementary in Lexington, Kentucky as they transition to implementing PBL whole school as a way to transform the learning experience for their students. CTL continues its relationship with Penn High School of Mishawaka, Indiana as teachers there implement PBL to engage learners in deeper more engaged learning. This story of WNDU describes a unit that one teacher implemented with students and describes how the students went beyond her expectations with their projects. Read more about what distinguishes CTL’s PBL program and the vision of teaching and learning that it helps to achieve. Research demonstrates that when implemented effectively, Project Based Learning can boost not only mastery of content but engagement in learning for all students. Edutopia’s PBL research review is an excellent summary of the proven impact of PBL and its research-based conceptual framework. The suggested three-year implementation of CTL’s PBL program begins with a three-day workshop in which teachers develop the framework of a standards-based project. Then twice during the first academic year, teachers participate in a day of project refinement prior to classroom implementation, observation and feedback during implementation, and a day of reflection and revision following implementation. In the following two years, teachers receive on-site and distance coaching by CTL PBL and content area experts, with the focus determined through ongoing formative assessment of needs.